School’s out for summer, right?! Summer break threw us for a loop about a month ago. But, with sensory breaks, intentional schedule changes, social stories, and milk shakes, we’ve been able to enjoy the outdoors and each other again. Social stories are underrated and I’m learning they are quickly becoming my life saver during school breaks. There are a number of similar iPad apps, but I used the My Stories app by Simplified Touch for $2.99, to create social stories on the iPad and it’s working wonders. Autistic children thrive on schedules and consistency, but they also must learn how to be flexible when life throws changes at them. 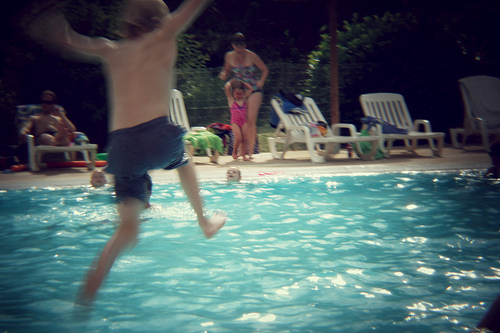 Last summer, my autistic son had the mother of all meltdowns at the pool after some changes in our routine. The poor little guy got overstimulated and just lost it. However, this year, we’ve had much success with the pool and with changing our schedules with the help of a simple social story. Social stories are great in helping children transition or prepare for the unexpected. In the past I used Microsoft Word or Powerpoint, but have since moved on to using strictly my iPad. It’s so easy because My Stories lets you use your own pictures and record your own voice, or your child’s voice. Kids love hearing themselves on audio. And since my iPad mini goes everywhere with us, I can whip up a social story in NO time! Before we hit the pool this summer, I created a social story with the My Stories app. I used all of our pool pictures from last year so the environment was familiar to my son. I also recorded my voice which made him flip out laughing hysterically! We’re from the south and I know I sound like it. He really got a kick out of it and yesterday, he recalled (in sequence) and verbalized the pool rules before we got there. I was a proud mom. If you need a tool to help ease transitions, lessen fixations, prevent meltdowns, or prepare your child for schedule changes, try a social story on the iPad. Really, it’s keeping our summer sane and helping my lil man focus on having fun and enjoying himself!